Prototype: Bavarian State Railways class EG 2x2/2 electric locomotive. The locomotive looks as it did around 1920. 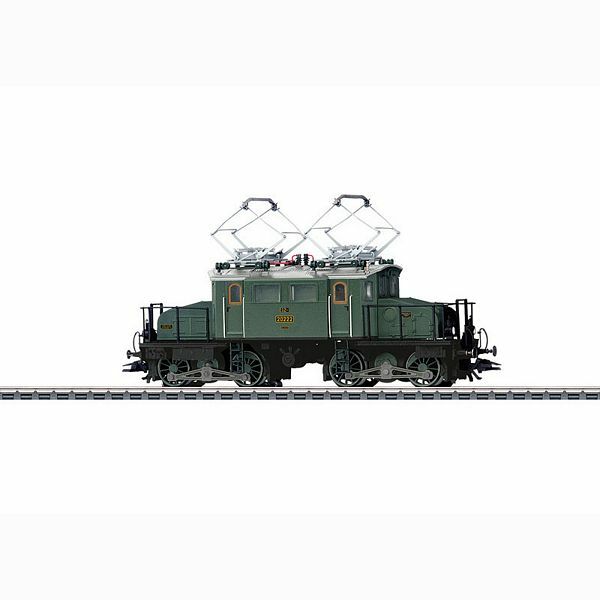 Model: This electric locomotive has an mfx digital decoder and extensive sound functions. It also has controlled high-efficiency propulsion. 2 axles and jackshafts powered. 2 traction tires. The locomotive has articulated running gear to negotiate sharp curves. The running gear is mounted to pivot under the fixed end areas of the locomotive. Maintenance-free warm white and red LEDs are used for the lighting. The headlights and marker lights will work in conventional operation and can be controlled digitally. Length over the buffers 14.3 cm / 5-5/8".